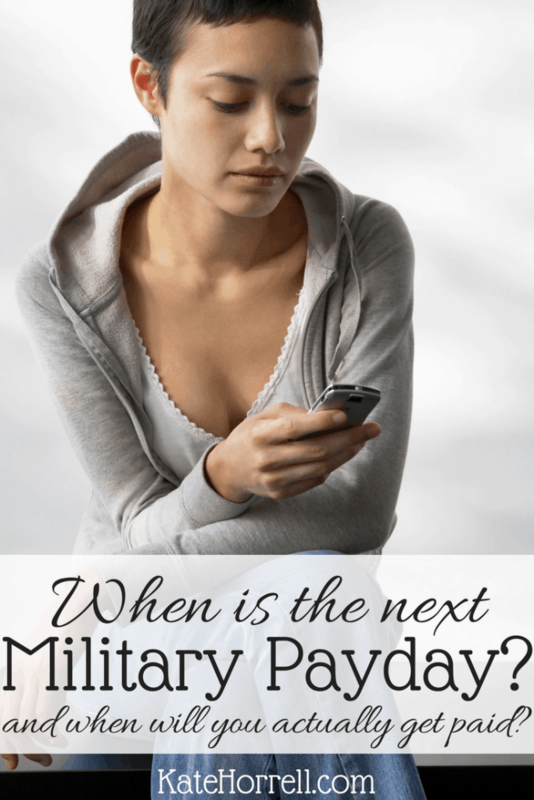 When Is The Next Military Payday? The next regular, active duty payday is Wednesday, 1 May 2019. When are you going to see that paycheck? Most military members will have their military pay deposited on Wednesday, 1 May 2019. However, depending on your bank or credit union, you may have access to your funds earlier if they offer early crediting of direct deposited military pay. The biggest bank that offers this benefit is USAA, and Navy Federal Credit Union (NFCU) offers it for members who use an Active Duty Checking account. USAA’s early crediting policy is straightforward and easy to understand: military pay deposits are credited one business day prior to the actual military payday. For this pay period, that will be Tuesday, 30 April 2019. That’s a long time since the last time you got paid! If you’re just making it from paycheck to paycheck, you might want to see 85 Ways To Get Through A Long Pay Period to plan how you’ll get by. Navy Federal Credit Union has two policies that are confusing to people. First, they have two different pay deposit dates, depending on what type of checking account you use. If you use an “Active Duty Checking” account, you get early crediting. If you use any other type of account, you don’t get early crediting. Second, they have a depositing system based on scheduling the deposit the day before, then crediting it overnight, that relies on the “day before” being a weekday. This means that sometimes even “regular” checking accounts get the benefit of early direct deposit, even though that is usually only a benefit of Active Duty Checking. So how’s this going to look over THIS payday? NFCU customers with Active Duty Checking accounts will see their pay posted overnight on Monday, 29 April 2019, to be available for use on Tuesday, 30 April 2019. NFCU customers who use any other type of checking account will see their pay posted overnight on Tuesday, 30 April 2019, to be available for use on Wednesday, 1 May 2019. Service Credit Union’s early crediting offer is “up to two business days,” pending the receipt of the pay files from the Defense Finance and Accounting Service (DFAS.) For this pay period, Service Credit Union anticipates crediting pay on Monday, 29 April 2019. Depending on how you plan your spending, knowing when the next military payday will come can make a big difference in your plans. Start planning for the year with the 2019 Active Duty Military pay post, or USAA customers can use the 2019 USAA Military Pay Posting article. Looking to learn more about financial issues that affect military families? Join the Military Money Questions and Answers Facebook group! NFCU direct deposits have always been confusing for me and many of my coworkers… especially when payday lands on a Monday. This article explains it much better than any that I have found. I have sent this link to several of my coworkers. Thank you for breaking it down into plain English. Love your pay calendars & posts, they are so helpful! Will you post a 2019 pay calendar soon? Thanks for all you do! For some reason I have not gotten payed yet. I have navy federal active duty checking. I’m stationed at fort Carson in Colorado. It usually drops around 10pm which is midnight where DFAS headquarters is. Any therious on if I should still get payed before Monday? Benjamin, Navy Federal members with Active Duty checking accounts should be paid sometimes overnight to be available for use today. It doesn’t always happen at an exact time – we’re talking about thousands of transactions here, and that takes some time. I’m guessing you got paid since you wrote this? Does this mean that the deposit hits tonight at midnight (4/11)? I don’t see a pending deposit like I usually do. The pay will post overnight from Thursday to Friday. There is no set time – it varies from pay period to pay period.